This is the time of year when runners start to count up their miles. Can I get to the next round number before January 1st? Will I reach the number I chose last January 1st? If I do, what does that say about me? If I don’t, what does THAT say about me? It’s pretty fascinating to read the zeitgeist in December and see how people are tallying things up. December is the season of many lists: Dave Barry’s Year In Review, celebrity-endorsed holiday gift guides galore, and perhaps the very best online media tradition of all (and my personal favorite annual read): Drew Magary’s Hater’s Guide to the Williams-Sonoma Catalog. If you’ve never checked that last one out, you’re welcome. What were the best things in 2018? How does 2018’s things compare to 2017’s things? We categorize, we summarize, we count, we compare. And we prepare to use our findings to decide what we’re going to categorize, summarize, count and compare in 2019. 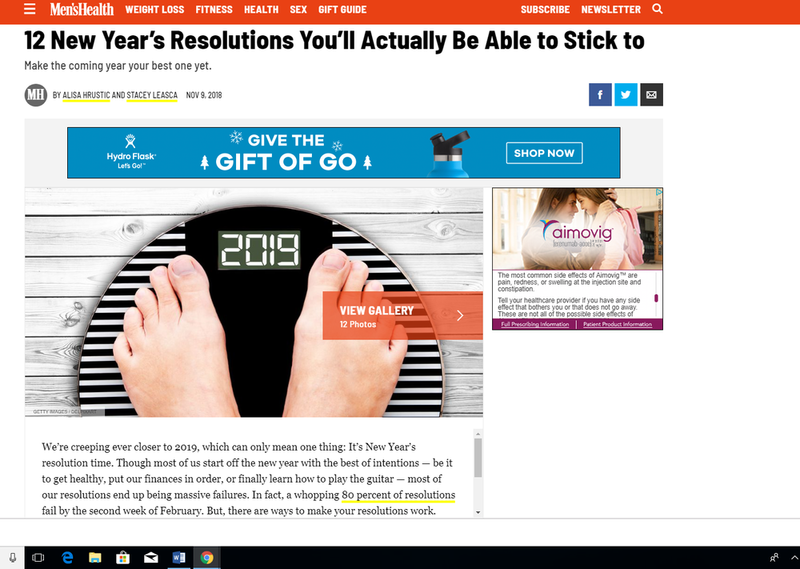 By the way, I’m…gratified?…to see that Men’s Health magazine is also giving its readers a chance to pre-emptively feel bad about themselves in 2019 by reminding them that scales are a thing. Equality, amirite? 2017 was GOALS. I was a machine in 2017. I wanted to spend the whole winter AND spring getting ready for a summer/fall training cycle to send me to an October marathon, my first marathon since having my daughter in 2015. Actual desire: run that marathon fast enough that it would somehow assure me that I was not done setting goals as a runner. In January and February, I ran in all the conditions Boston threw at me, and I thought about that marathon every day. Running 10 miles in the snow? That’s right - 10 months from now it will pay off! 6 days a week included some component of running, strength and mobility. I got serious about nutrition, I went to bed early, and I controlled all the controllables. I ran my highest mileage in any training cycle ever and I felt amazing. Then, my two-year-old sneezed in my face a week before the marathon, and three days later my sinuses were full of bricks. I cleared out just enough to feel like I could run the race, and I did, but I sure didn’t have the day that my impeccable year of running had teed me up for. I “accomplished” my “goal”: I ran my first marathon since having Ros. But I had to deal with the fact that all my hard work was not enough to guarantee me anything in any given race. And I had to deal with the fact that I was crushingly disappointed by what was supposed to be a celebration of that hard work. After that burn, 2018 was no goals. No goals allowed, actually. No races that I had to commit to more than a week in advance, and no 20-week training cycles for ANY race. If a race was coming up and I was healthy and the weather looked decent, I signed up. If I woke up on the day of the race and I wanted to run hard, I ran hard. I considered a fall marathon purely because it was an hour away and never sold out before race day. As it turned out, I never signed up for it and ultimately decided not to do it (though I did run 3+ hours every Saturday for a couple of months, just in case). As long as I didn’t stop running and doing my strength and mobility to stay healthy, I was winning, and in 2018 I got to win every week. In 2017, I ran four races. One of them was good. All were meticulously planned for, researched, obsessed-over, and yes, 75% of them were huge, ruin-your-week disappointments (or in the case of the congested marathon, a ruin-your-month-and-possibly-your-spirit disappointment). Objectively, I knew that 2017 “shouldn’t” have felt disappointing. It was a great year for my fitness and health. I ran 1,533 miles and for most of the year, I ran 6 days a week. I had never been able to run 6 days a week without aches and pains setting in. Had there been less pressure, fewer expectations, for any of those races, I might have looked back on 2017 as the year of my life. Keeping track, checking boxes and chasing numbers made an objectively great year into a year that I felt like I had to constantly qualify to myself as not-really-a-failure. I think I actually learned a lesson from the pointlessness of being disappointed by 2017, and that lesson turned into the gift of 2018. In 2018, by the seat of my pants, I ran seven races, and six of them were not just good, but great. Four of them were all-time personal bests. All of them completely exceeded expectations and made me truly happy, a kind of happy I can go back to in my mind on a bad day and take hold of and savor. It’s not that I had no excitement or anticipation surrounding any of those races; of course, I did. I got nervous in the days leading up to them and I had butterflies at every start line. But rather than the nerves of pressure, they were the nerves of wondering what might happen and how it would feel. I didn’t look at my 2018 “stats” or even think about tallying the miles until a couple of weeks ago, and to my surprise, I have already surpassed my 2017 mileage total by more than 100, with a month left to go and nothing but the desire to keep going. Not towards anything, just building my foundation one brick at a time without stopping to think about where the top will be. I have a group of friends right now who are training for an ultramarathon in 2019, and they are working their asses off. Multiple daily strength circuits - 5 or 6, in some cases - and, most recently, a hill workout called “Coach Wants Me Dead.” I am proud of them, I am excited for them, and…no, I don’t want to run an ultramarathon in 2019. In fact, I can’t think of a single tangible goal that attracts me, a single statistic that I want to track, a single resolution that I want to make. What I want is to do the same grueling squat circuits that my ultra friends are doing. I want to run and run and run and never stop to count the miles until I’ve already pleasantly surprised myself. I want to jump into a race now and then with no stats on my watch to see what I’ve got. And I want what I’ve got that day to ALWAYS feel like enough.